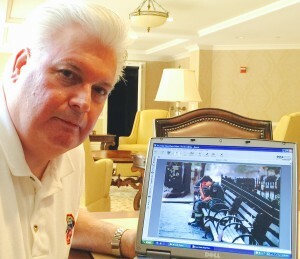 Dan Potter, first responder on 9/11, with a photo of himself that appeared worldwide, captured at a moment when, after hours of searching for his wife, shows him dealing with the possibility that she may not have managed to escape from the 81st floor of Tower One (later he found that she had). Soon after I moved into my new residence at Trump Park in Yorktown, a neighbor named Dan Potter introduced himself to me as a retired fireman from New York City and said that he had read my column about Fireman Joe who instructed school children about fire safety in the home. Dan told me not to forget about seniors who have a much higher risk of dying from fire in their own homes than the general population and that he had done educational programs for them on the subject. I told him that I wanted to know more. This week we got together and I learned number of new things, some surprising, including his personal history. 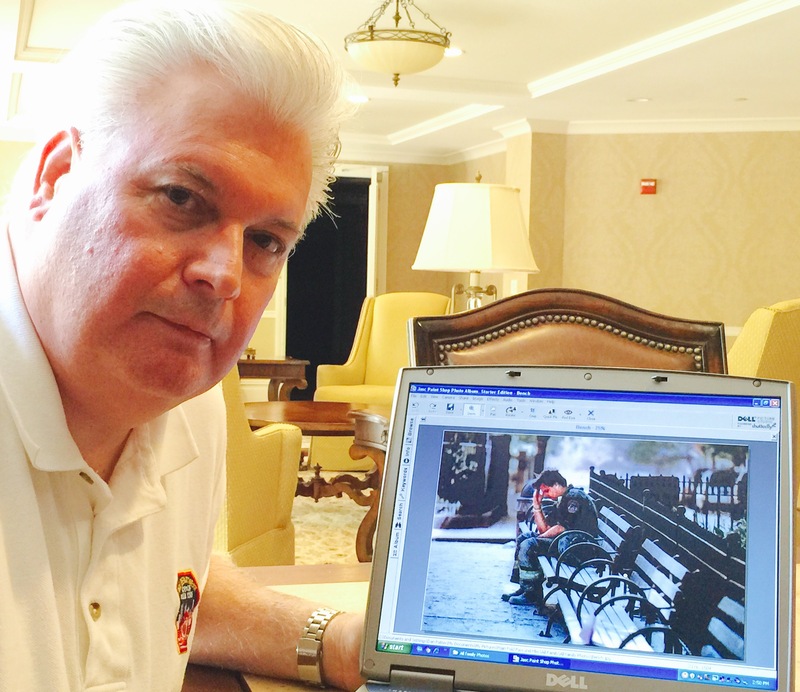 Dan had been at the World Trade Center on 9/11 as one of the first responders, arriving between the times the first and second planes hit the towers. His wife Jean was working in Tower One on the 81st floor and for some hours, he didn’t know whether she had made it out of the building. After searching both at the site and at his apartment just a block away and not finding her, he collapsed on a bench in despair and a passing photographer captured the moment. That photograph appeared “around the world” and now is featured in the 9/11 Memorial Museum next to Dan’s helmet with his ladder number “31” which he wore that day. We started our interview with a pop quiz: “Do you know why Fire Prevention Week is the first week in October?” he asked. When I confessed that I had no idea, he informed me that it was enacted by Congress after the Great Fire in Chicago which had happened at that time of year. “So tell me more that I don’t know about fire safety,” I asked. “While most people have smoke detectors in their homes, the batteries are frequently dead,” Dan said. “Or they can be cooking, the alarm goes off, they might take them down, take the batteries out and not put them back,” he continued. Dan’s next question caught me off guard. “Have you ever been in a fire?” “No,” I responded. “Do you think you really know what fire is? Do you think it has sound? Do you know how fast it is? How hot it is?” I didn’t have answers for him. He took out his computer and showed me a controlled demonstration of a sofa catching fire in a monitored situation. Within 30 seconds, there was intense heat. Within one minute there was no way that a person could stand. He would be down. Within two minutes, the room was engulfed in flame and within three minutes, there was total conflagration. All the while, there was silence, not the crackling of wood and the roar we would expect from a romantic fire. “When we hear stories about expecting a parent to run back into a house to rescue a child, sadly the heat is so intense, so much more than anyone has ever experienced,” Dan said, “it just doesn’t happen.” I remember thinking that that is what happened at the World Trade Center when those poor souls had the terrible choice to make of being burned alive or jumping to their deaths. There was one last sobering thought that Dan conveyed to me. When the Avalon in New Jersey burned to the ground recently, it went very quickly. “Yes, that was a ‘combustible’ building, ‘stick-built’ of wood. In this day and age, it’s a wonder that multi-unit buildings of that type are still allowed.” “And my building? The Trump Residences, what type of building is that?” I asked, perhaps with a touch of anxiety. “It’s non-combustible, made of cement and steel,” he responded. It’s scary to consider the number of people who live in multi-unit condos and apartments that are of combustible construction. I would urge readers to be aware of escape instructions and for those of you living in single family dwellings, listen to your children who learn fire safety tips at school. Check every smoke detector in the house and, again, be prepared in an emergency to get out! For more information about fire safety, go to www.nfpa.org.